Concept Research in Food Product Design and Development remedies this inattention to product concepts by providing a unique treatment of concepts for the business professional as well as for research scientists. The book begins with simple principles of concepts, moves forward to methods for testing concepts, and then on to more substantive areas such as establishing validity, testing internationally and with children, creating databases, and selling in new methods for concept testing. The book combines a “how to” business book with a detailed treatment of the different facets of concept research. As such, the book represents a unique contribution to business applications in food, and consumer research methods. The book is positioned specifically for foods, to maintain a focus on a coherent set of topics. Concept Research in Food Product Design and Development appeals to a wide variety of audiences: R&D, marketing, sensory analysts, and universities alike. Corporate R&D professionals will learn how to create strong concepts. Marketers will recognize how concepts are at the heart of their business. Sensory analysts will find the book a natural extension of their interest in product features. 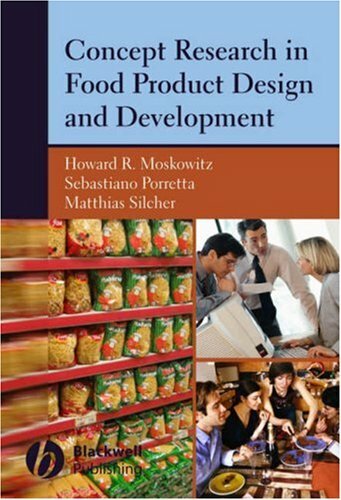 University students will understand how concept research is a critical part of the “consumer-connection.” Concept Research in Food Product Design and Development is the definitive, innovative text in describing how to create, analyze, and capitalize upon new product concepts. If you have any questions about this product by Wiley-Blackwell, contact us by completing and submitting the form below. If you are looking for a specif part number, please include it with your message.